WebSphere Commerce is a powerful tool, but it generally requires IT support, even for quick updates to a webpage. 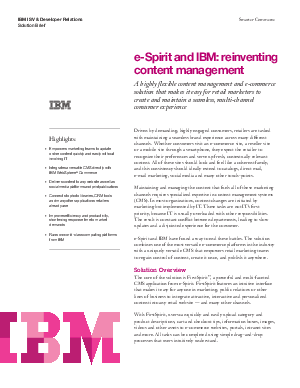 The e-Spirit content management system is designed to seamlessly integrate with IBM WebSphere Commerce. Now marketers can make changes to the online shop directly within the content management system even utilizing content from other systems like PIM and MAM or WebApplications with no IT involved, creating exciting online shop experiences. This one of a kind integration has been used by globally known retail brands and provides an out-of-the box solution for powering world-class customer experiences, faster time to market and dramatically increased online revenues.